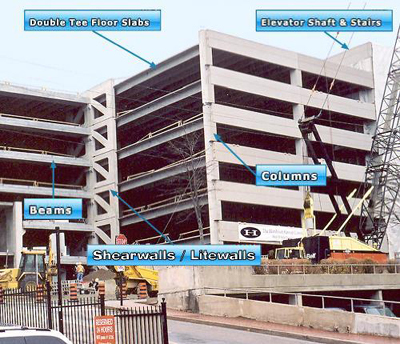 Home » Concrete » Precast & Prestressed » Building Systems » Parking Garages » Building a Precast Garage? Double Tee widths supplied are up to 12 feet; typical spans are 55 to 60 feet for 2 rows of parking with two way travel. Typically, Strescon designs and builds the precast structure on foundations designed and supplied by others. Other elements supplied by others are: caulking, field-applied topping, sealing of decks, miscellaneous metals, hand rails, guardrails, ticket booths, security systems, painting, signage and elevators; however, Strescon can supply turnkey system packages in specific instances.